Each individual vessel in the surface forces is also assigned a grade, which is the same grade as the commanding officer (CO) and political officer. Because the PLA's organizational structure does not allow for an organization at one level to be subordinate to another organization at the same level, each PLAN vessel has a lower grade than its headquarters. During the 2000s, the PLAN has been restructuring its surface forces' organizational structure to better meet its operational needs. 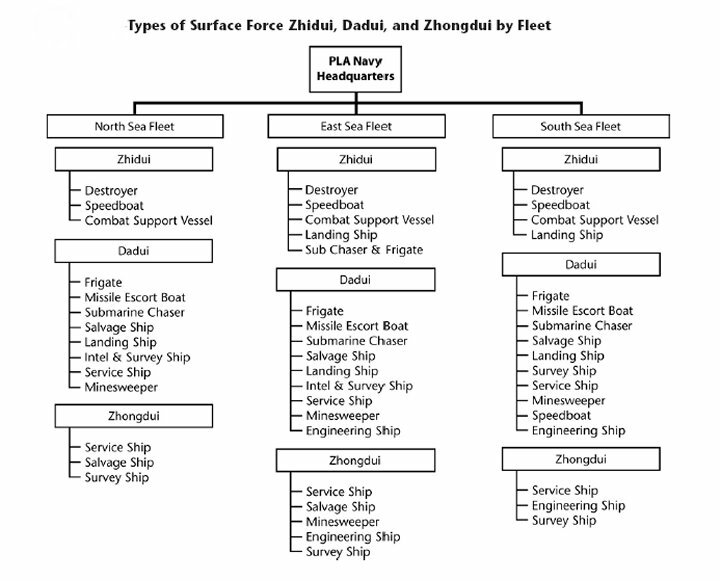 For example, in 2004 the PLAN created a new zhidui-level organization identified as a Combat Support Vessel Zhidui in each fleet. Several existing vessel dadui were re-subordinated to the zhidui to provide better guidance for support for combat vessels at sea. In addition, the East Sea Fleet created a new submarine chaser and frigate zhidui. 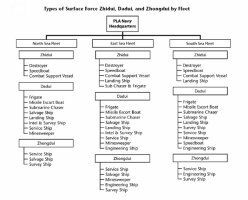 When vessels from the same or different zhidui and dadui are organized into task forces, the task force is assigned the grade of the vessel with the highest grade, not that of the officer with the highest grade. For example, if a deputy fleet commander, who is a jun leader-grade (grade 5) officer, is the task force commander and is aboard a destroyer, the grade of the task force is still that of the regiment leader-grade (grade 9) destroyer.